It has been another busy and exciting year for our housing group. We’ve seen our group grow (both in numbers and in confidence!) and together we’ve achieved lots of important victories. The commitment and determination our members have shown to the group and to each other has helped the group grow and achieve more together, both on our individual cases and in building a strong network of practical solidarity and action across south London. We had to change our meeting venues as we were too overcrowded in our old meeting rooms. We’ve started an almost-regular kids club for HASL children. We’ve also seen lots of our long-term members move into council housing and we’ve seen how the security, adequate space, and cheaper rents have transformed the lives of these members. We’ve also helped members improve their housing situations by helping them with homeless applications, supporting them to challenge unsuitable temporary accommodation, challenging private landlords over deposits and disrepair and helping to stop a number of evictions. Here are some of our highlights of the year – but these are just a selection of things that we have been up to. We’ve been organising on a pretty much daily basis, providing help and information, support, buddying, food and friendship for each other. We have our 2 meetings each month which have been really busy and where we provide most of our support for each other. We are learning and enforcing our rights together and helping each other. We campaign for more than the rights we currently have as these do not protect us enough – we want good quality, secure, truly affordable homes for everyone and our lives and communities free from poverty. As people dealing with serious housing and poverty problems, organising this practical solidarity is a massive achievement. We know that the housing and poverty crisis we face in London and beyond is huge. But we’ve seen that acting together we can get important wins and fight for our needs and communities. In 2018 we’ll continue to fight for the good quality council homes in our communities that we all desperately need and deserve (and against the government’s plans to introduce fixed-term council tenancies), along with local campaigns such as challenging Southwark council’s use of hostel accommodation and Lambeth council’s confusing homeless ‘assistance’. Thanks to all our members and supporters for all your help over the last year! A big thanks to all the other wonderful groups we’ve had such fun organising with including English for Action and North East London Migrant Action. We’re part of the London Coalition Against Poverty – you can sign up to our irregular email newsletter here for news, events and how to get involved. A busy and productive meeting in January! We visited Lambeth County Court 4 times in February and early March supporting our members facing eviction from private rented housing. Going to court is a really stressful experience – no one should do it alone! There was a big gang of us in Lambeth County Court and it really helped to have so much help and support – although it was still a stressful experience no one should have to go through! We ran a housing rights workshop with Cleaners and Allied Independent Workers Union at Mayday rooms making links between our two groups and sharing basic housing rights and plans for action. Screening of I, Daniel Blake organised by DIY Space for London followed by a Q&A with us afterwards. HASL families living in overcrowded housing made a short video to highlight their situations and as part of their ongoing campaign for Southwark council to take urgent action on overcrowding. We helped with Freedom of Information requests to learn more about how the Home Office, local councils and homeless charities were conducting raids on EEA national rough sleepers to detain and deport them. Corporate Watch turned this into a report here. North East London Migrant action have been organising campaigning and resistance to challenge this racist and hateful policy, including the court case in November. This policy was found to be unlawful by the court in December! A brilliant example of grassroots solidarity and campaigning combined with legal action. The Brixton Blog covered some of our Lambeth council gatekeeping stories. We hosted the London Coalition Against Poverty general meeting and wrote about it here. It’s great to meet our sister groups from across London and organise and socialise together. We shared lots of successes, tactics, and made plans and good action points. We ran a housing rights workshop with the brilliant English For Action at one of their classes in Lambeth. Their students were really engaged as we discussed the housing rights we have and things that we can do to get more! We organised a twitter storm and launched a petition in support of our long-term members who were being denied help by Southwark council for their severely overcrowded and unacceptable living conditions. Later on in the year, the families all eventually got the council housing they desperately needed, but they should never have faced such poor treatment from the council. With many of our members concerned about what Brexit would mean for them and their families, we contacted Southwark Law Centre who came to deliver a ‘Know Your Rights’ workshop for us. We featured in the Southwark News talking about our experiences of out-of-borough temporary accommodation. We decided to canvas the Labour canvassers who had been leafleting in our Walworth area. We confronted the Labour canvassers demanding their commitment to immediate action on our serious housing cases that we presented them with. Whilst they made empty promises to look into the cases, we also leafleted and held our ‘No More Overcrowding’ banner outside Morrisons and received a very warm response from passersby. 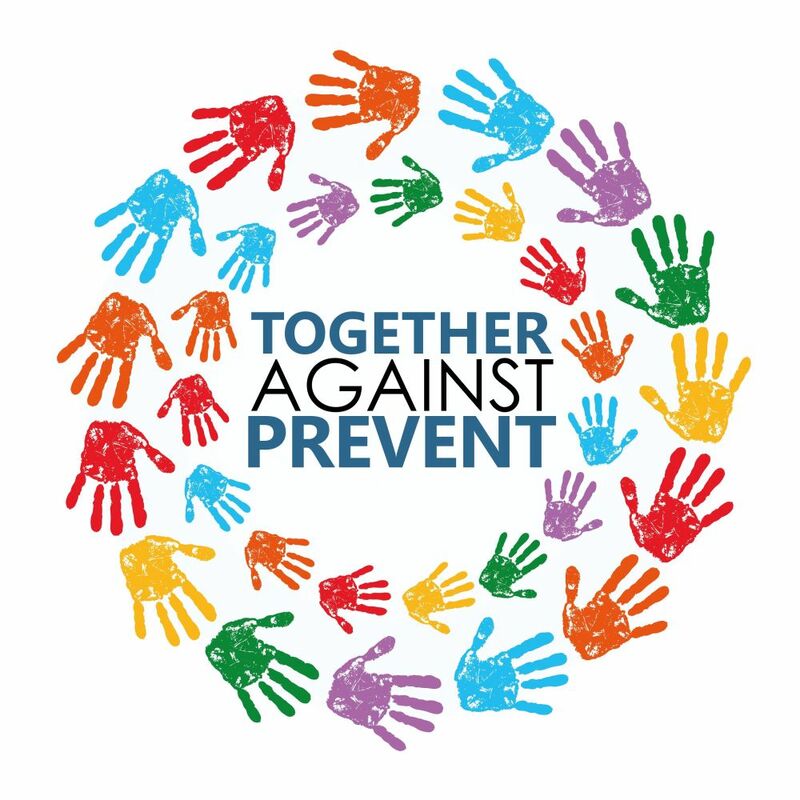 Brilliant and very useful blog from EFA London (English for Action) helping us to talk about and understand the Grenfell tragedy and how as people dealing with bad and unsuitable housing, we can organise for the safe, secure homes we all need. We had our first kids homework club in Peckham library. Lots of HASL kids are dealing with really stressful and unsuitable housing, so it’s nice to have a space centred around them and to make our activities more kid friendly! We had some of our research looking at how London councils are forcing homeless families out of the city published in Legal Action magazine. We helped run a workshop at the Get Organised! day long event for grassroots groups to skill share and build links together. HASL summer BBQ in Burgess Park. Our member Alvaro and his family spoke about living in overcrowded housing and Southwark council’s disgusting treatment of them for Channel 4 news – we were very proud of them! We wrote about their case and four other families also in overcrowded housing for Verso’s blog here. Homemade cheesecake and lasagne at our kids club! We helped run a packed workshop on organising practical solidarity at the London Anarchist Bookfair with our friends Haringey Housing Action Group, Edinburgh Coalition Against Poverty and Brighton Solfed. We also had a very stylish stall with lots of housing rights leaflets as well as screen printed t-shirts and tote bags. We joined the brilliant United Voices of the World the union at their monthly meeting to talk about housing rights and how we fight for the secure, quality council homes we all need. The UVW members were so welcoming and engaged with the workshop – it was so much fun to join them. We can’t wait to work together more as there is so much overlap between the issues we are dealing with and our organising tactics! We supported an important court case challenging the racist Home Office policy of detaining and deporting EEA nationals who were rough sleeping. This court case was organised by our friends North East London Migrant Action who have been campaigning and resisting this hateful policy. We helped with an in-depth interview about our organising here for Shine A Light. Southwark council threatened to evict one of our members and force her to Nottingham where they say she has a ‘local connection’. We helped to guarantee her an extra month in her temporary accommodation, but we want the council to accept a full homeless duty to our member and house her in suitable temporary accommodation. We’ll be supporting our member to challenge the council’s appalling treatment of her. Our busy last meeting of the year with cake that one of our members made for us! This entry was posted in News/updates, Uncategorized and tagged action, London Coalition Against Poverty, organising, win on December 24, 2017 by housingactionsl. 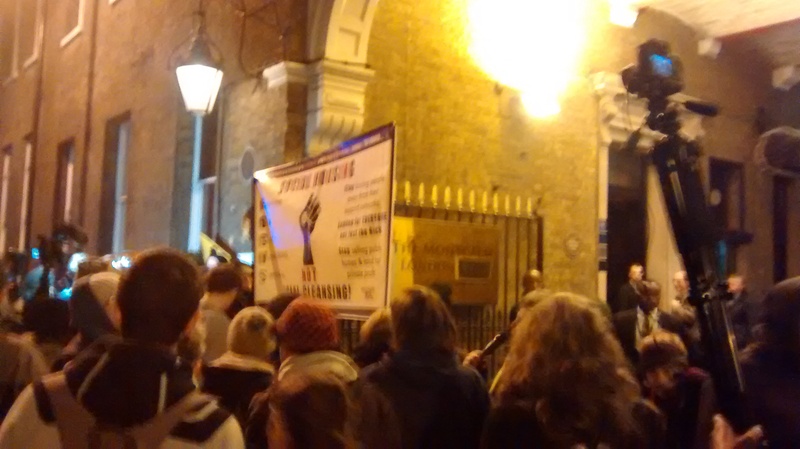 Southwark council – no more excuses, no more housing nightmares! This morning, HASL and our friends from Espacio Mama and English for Action visited Southwark council’s town hall in support of 5 families who face statutory overcrowding and have been subjected to long delays by Southwark council in getting the help they need. As Southwark council’s housing allocations policy states, these families should qualify for band 1 due to the serious and appalling nature of their living conditions. However, the council have insultingly responded that the families have caused the statutory overcrowding by a ‘deliberate act’. We know this is not true and it is an insult to even suggest this. It is basic common sense that these families have not endured years of severely overcrowded housing deliberately. We demand that Southwark council follow its clear housing allocations policy and ensure these families are placed into band 1 immediately, the banding that reflects their severe housing need. At the town hall, we bumped into the manager for homeless services Ian Swift on his way in to work, but instead of engaging with the group, he rushed past us, and instructed security to call the police on us! Thankfully, the security staff decided this was not necessary and we were able to remain in the town hall and were not thrown out into the cold! Two members from the press office came to speak with us about why we were there. We explained the 5 cases and the two members of staff agreed with us on a number of occasions that it was obvious that the overcrowded situations were not caused by a ‘deliberate act’ of the families. They promised that the cases would be looked into by Housing Director Gerri Scott and that we will hear from them soon. Let’s hope that we get some good news soon, and if not, we’ll be returning! One member first submitted information on her case on 23 May. She did not get a response for 3 months, and only then, because we contacted the council to chase up the case. We first emailed Ian Swift about these five cases on 25th July detailing the statutory overcrowding and how they had all tried to access the housing register and had faced a number of problems doing so. August we received a response finally saying that no applications are open for anyone and no documents have been received (even though 2 had receipts of having accounts). The group had actually visited the housing office and one stop shop on 25 July to submit information and documents, which had obviously not been processed. HASL met with Ian Swift and a number of housing officers on September 14 where we requested to be told the information they needed in order to review these cases quickly, but they refused to tell us what further information was needed. We were promised that the cases would be independently reviewed within 10 days. 10 working days later and we had heard nothing. After a reminder, the person who had originally looked at the cases returned the reviews to us on October 10. Accessing the housing register has been an extremely difficult process to follow and understand, particularly for non-English speakers as many of our members are. In total, we have spent a great deal of our time over many months emailing Ian Swift and his officers, collecting together all the required information, to resolve these cases. Some might say we have been doing their job for them! These serious cases should not be taking months to resolve. Children and young people without space to study and play. Children experiencing depression and mental ill health due to the overcrowded conditions. Poor conditions, including the ceiling falling through in the kitchen, and the landlord renting out another room to an abusive person who threatened our member. The children are too scared to enter the kitchen after seeing the ceiling fall in. Highly unsuitable shared accommodation for families with young children. Once these cases are resolved, and the families are placed in their correct band 1, we will be happy to work with the council and in particular the housing office, so that the problems we have faced here and not encountered again. This entry was posted in Action, Uncategorized and tagged action, overcrowding, southwark council on October 24, 2016 by housingactionsl. This morning, over twenty of us visited Olive Morris House with the simple request that the family be given the suitable social housing they would have had if Lambeth had given them the help they were entitled to back in May last year. ML’s case is one of total neglect by Lambeth council that resulted in her being physically assaulted in the overcrowded shared housing she had visited them to get assistance with. We demand accountability and justice from the council. Our visit resulted in a short meeting with the manager of the housing office. Whilst they said that they would contact us by the end of the day about the case, they refused to meet our basic request that the family be given secure, social housing in their local area. They also called the police on our group as they were keen to get us out. But we left in our own time of our own accord. Although we have not got our immediate request met on this visit, we have made our message very clear and spoke to people high up in the housing office to make them aware of this case, the urgent need for action, and that we will continue until our request for suitable social housing is met. We promised that if our request is not met, we will return as a (growing!) group until it is. Please get involved and join us to fight for good quality homes we all need and deserve! And why not tweet @lambeth_council @cllr_peck in support of ML to keep the pressure on them. 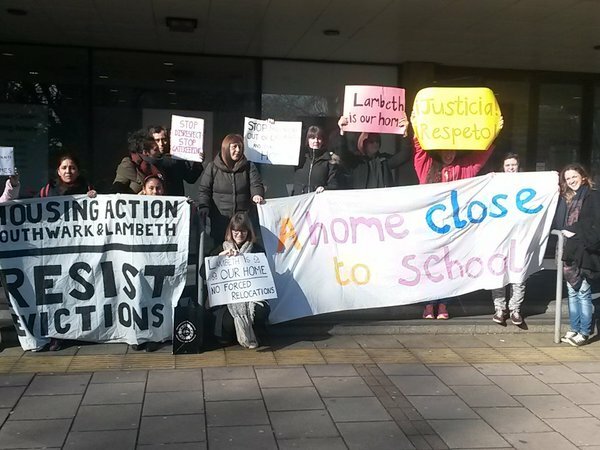 This entry was posted in Action and tagged action, gatekeeping, Lambeth Council on February 19, 2016 by housingactionsl. For some time, we’ve been campaigning against the culture of abuse at Southwark Council’s Housing Office in Peckham. HASL – Starting from yesterday – will be outside the office every day this week between 11am and 2pm handing out leaflets, talking to, and supporting people who have to experience the housing office’s sustained bullying, intimidation and gatekeeping. We hope to demonstrate that the abuse is not isolated to a few individuals, but endemic to the everyday running of the office. If Monday’s session was anything to go by, this seems to be the case. Within 5 minutes setting up the stall on Monday, the security manager and another security officer (M) approached us and began quoting made-up laws about draping our banner on the railings. They began to verbally abuse us and M made direct threats to a member of the group (M also appears in this video where we were denied entry to the building when attempting to support someone who requested it.) When we realised they were simply trying to distract us we ignored them and they gave up. By the end of the session, the offices were unguarded, save for a few housing officers coming out to look at us and the odd gratuitously hurtful comments made by the security manager as he criticised the parenting of a woman who was talking with HASL (people have also reported experiences of victim-blaming by the council, women in particular are often unfairly criticised about their parenting skills because they are in poverty). A pregnant mum with a young child who was forced into rent arrears when she got a part time job and the benefits office stopped her housing benefit altogether even though she wasn’t earning enough to justify the wholesale slash in her benefit. The council gave away the direct offer of permanent accommodation they made to her because of the rent arrears and they have now got the bailiffs scheduled for this Friday to evict her from her home. We will be supporting B and her family to resist this eviction on Friday at 10:30am. A women who is street homeless and has been trying to secure a homelessness interview for over two weeks, and keeps being turned away. Today she was forcefully removed from the housing office with all her belongings. Southwark told her to come back on Wednesday, but even with an appointment, as we saw with another young woman today, the caseworker might not be at the office at the scheduled time. This lady has nowhere to go, so she is likely to sleep outside the housing office until Wednesday. A pregnant women with 3 young children being evicted from her private rental property due to a bureaucratic error with her housing benefit payments. Unable to find alternative accommodation, Southwark Council have repeatedly turned her away without offering explanation or advice. A pregnant woman who’s been in stage 1 B&B temp accommodation for 11 weeks (people are supposed to be moved to more permanent and suitable temporary accommodation after 6 weeks). The council keeps trying to force her to distance areas, all of which would make it impossible for her child to attend their school in Peckham. A pensioner who stopped to speak to us just because she was passing by on her way home. She then came back after she found a letter in her post box asking her to leave her temporary accommodation by the 6th July. She has a serious medical conditions and is very concerned about what will happen in the coming days. We encouraged her to speak to a housing officer at the council, and when she returned she told us that the eviction notice was about a payment she was said to owe – this wasn’t mentioned on the scary and confusing eviction notice. A young woman waiting outside the housing office to meet with her social worker, at her social worker’s request. Her social worker has told her to get a job and find a private rental. The woman didn’t know what the meeting was about, but she was waiting around for it, expecting a call at 12:30. At 12:35 she went in to the office and was told that the social worker was not available. She left still not knowing why she was asked to come there. Many people who turn up are simply turned away without reason or told things that simply act to delay them getting the help and support they need. People are told to come back at arbitrary points in the future, without appointments. Appointments that are offered regularly result in unexplained non-attendance from council officers. People are told very little information, and find it very difficult to know how their cases are progressing, adding stress to an already hugely stressful situation. Gatekeeping practices, which Southwark has been called out on by the courts, are business as usual at the housing office. Based on our conversations with many people today, not a single person we met had been dealt with according to the Code of Guidance or the relevant legislation. It appears that this is a housing office utterly out of control. We handed out lots of leaflets, were able to talk to lots of people about what should be happening if Southwark Council were to operate even nominally within their own publicly stated practices. People were grateful to have the opportunity talk and share in each others struggles. We talked about the experiences HASL has had as a group – all of which was really warmly received. We can fight this treatment, if we do it together. People are quite rightly furious at the way they are treated, and we talked about ways we could work together to seek some kind of justice. The stall also offered a chance for newer faces to the group to become more comfortable talking to people, and we were able to share the knowledge we’ve picked up together. If you can spare even an hour this week to offer support to these stalls, please do drop by any day from now until Friday, from 11am-2pm. Peckham Housing Office, 25 Bournemouth Road, London, SE15 4UJ. We’ll also be talking about the events of the week at our lunch club picnic on Saturday. This entry was posted in Action, Our stories and tagged action, action call out, Bournemouth road housing office on June 30, 2015 by HASL. Intimidation and policing of the homeless and vulnerably housed continues at Southwark’s housing offices, however this time we caught it on film. Southwark have been under fire recently for the many ways in which they deny people making homelessness applications their right to housing. At the start of this year the High Court ordered Southwark to cease certain practices of gatekeeping “with immediate effect,” and in May the Supreme Court found Southwark was wrongly denying its duty of care. Have they changed their tune? Not a bit. On Friday the 5th of June HASL members were distributing flyers in front of the housing office (without reason we were denied permission to give out flyers in the office) when we met F, a single father of one who had been evicted from his accommodation by his landlord and had been forced to stay with a friend who was now also forcing the family to leave. Having spent the morning at the office, Southwark denied F a homelessness interview. Instead, Southwark turned F away stating, as shown in Southwark’s summary of the meeting with F, that the friend was required to give a period of 28 days for F to search for private accommodation. This false information shows the continued practices of gatekeeping by Southwark Council. A HASL member agreed to accompany F and his son back to the office at F’s request. The video above shows what happened. This is not the first time that HASL members and homelessness applicants have experience arbitrary bullying and intimidation at these offices, it is however the first instance we have on film. HASL members were called ‘trouble makers’, we were denied entry on the grounds that ‘we knew why,’ that ‘we were not professional’ and that ‘we wanted to cause chaos in the offices.’ Other applicants at the office that day joined our efforts to speak with the security guards who made no attempts to discuss the matter with us nor consult the letter from Southwark’s cabinet members. The manager in the office that day failed to speak with us or deescalate the situation and instead called the police who when they appeared affirmed the right of the security guards to use reasonable force to remove us from the premises should we attempt to enter. Despite all this, as you may imagine, we had a great response from the leaflets and lots of support from people at the office that day. F, on returning to the office with our advice, was granted a homelessness interview, as is the law, and HASL gained a new member in the process. HASL believe that the housing crisis is not caused by the most vulnerable, upon whom the blame and the effects of the crisis largely land. We refuse the intimidation and all gate-keeping practices of Southwark and fight for our members to be treated with respect. Another housing system is possible, and at this point it starts with the right to be accompanied to interviews! You don’t have to attend a homelessness interview alone: join your local housing group! This entry was posted in Statement and tagged action, Bournemouth road housing office, council housing on June 8, 2015 by HASL. 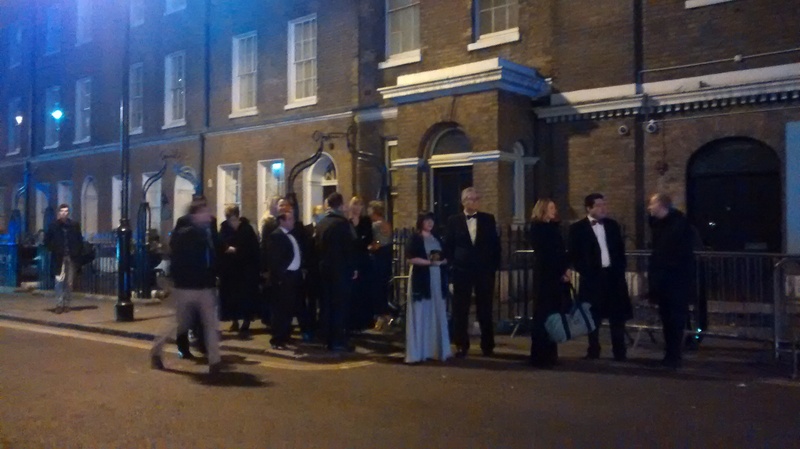 A bailiffs’ awards ceremony was gate-crashed on Wednesday evening by a sixty strong group of angry people. The action was called just a day beforehand by Focus E15 mums after an eagle eyed member of their campaign spotted the existence of the 2015 British Credit Awards with awards going for ‘Enforcement team of the year’ and ‘third party debt collections team of the year’. A table at the event was £4,000. 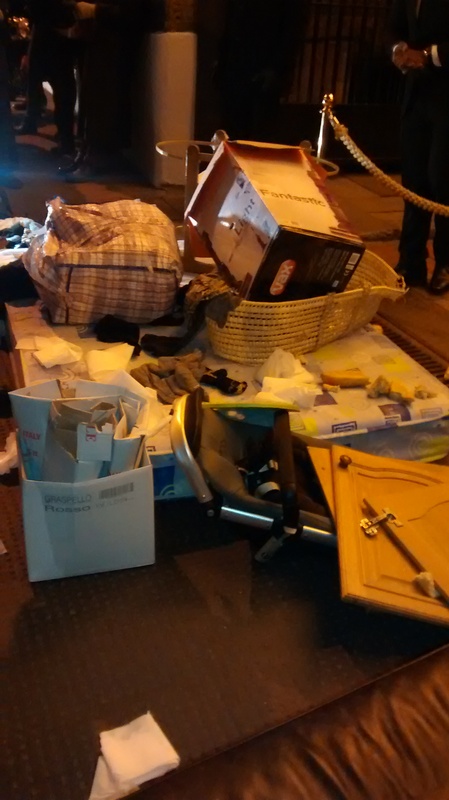 Focus E15 mums, other housing groups from across London, and squatters – all people who regularly confront and are abused by bailiffs – blockaded the entrance with a mock eviction; a mattress, clothes, kids toys, and an armchair were scattered on the pavement obstructing the bailiffs. The crowd of sixty people quickly built up and turned bailiffs who tried to get through them away. “How does it feel to feel scared?” asked one protester to a bailiff. 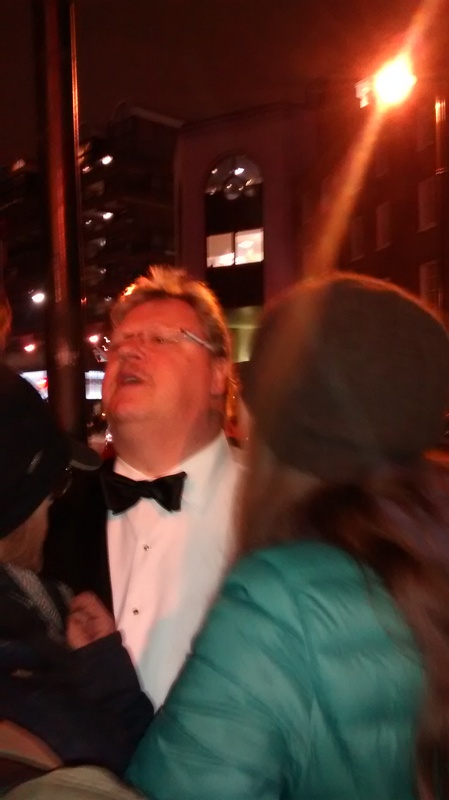 “I’m not scared,” he responded as he called to the police for assistance and had his tux covered in paint. The area was filled with shouts of ‘bailiff scum off our street’ and sometimes simply ‘scum’ each time a bailiff appeared. More bailiffs, and badly placed protesters, were hit by paint bombs. Later on, someone saw a delivery of new suits to the building where the dinner was being held. A line of bailiffs and their friends formed on the other side of the road from the protesters contemplating the angry mob ahead of them. After a while, the bailiffs were forced to use a side entrance to get to their fancy dinner. Police got pretty scared of the size and mood of the crowd and brought along more cops for back up and police dogs to guard the entrance. When the bailiff flow ceased at the main entrance, a group of protesters went to the side entrance where the bailiffs were sneaking in. At this point, the police made an incredibly violent arrest of a young man with four large police men pinning him down, one police officer hitting the man’s face on the pavement, another punching him in the body. 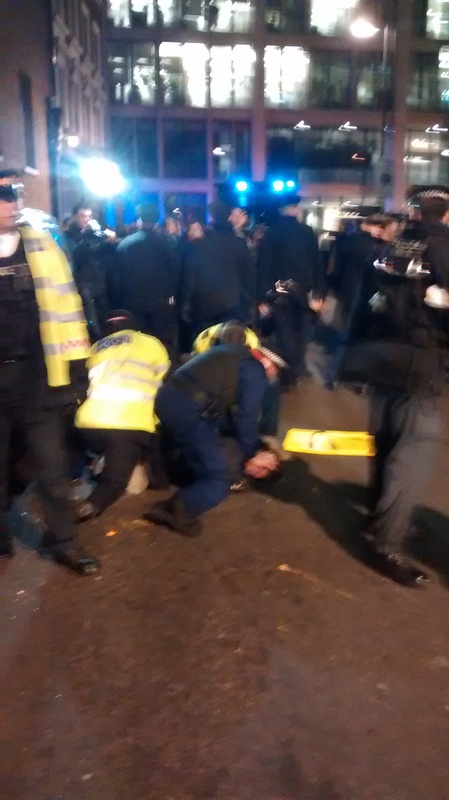 He was kept in this position for around ten minutes with police keeping away people trying to film the incident and provide support to the man. The police brutality aside, the evening was considered a great success by those of us who didn’t have the £4,000 for a table. A number of us remarked how therapeutic it had been to confront the bailiffs in this way. The energetic and militant action is another exciting articulation of the growing London housing movement; already this year, as well as the exhilarating evening crashing the bailiffs’ ball, there has been the impressive March for Homes and the ongoing Aylesbury estate occupation in Elephant and Castle. The Radical Housing Network’s week of action starts on Saturday 14th February – Monday 23rd. As well as these events, there is the daily community organising by a growing number of local housing action groups across the city who confront bailiffs on the doorsteps, make mass visits to the housing office in support of their members and provide moral support and solidarity. Wednesday evening brought together these groups and squatters from across London, making it clear that we won’t take baliff violence and the violence of the housing crisis. Cops and bailiffs out of our communities! We all need quality, secure homes that we control! 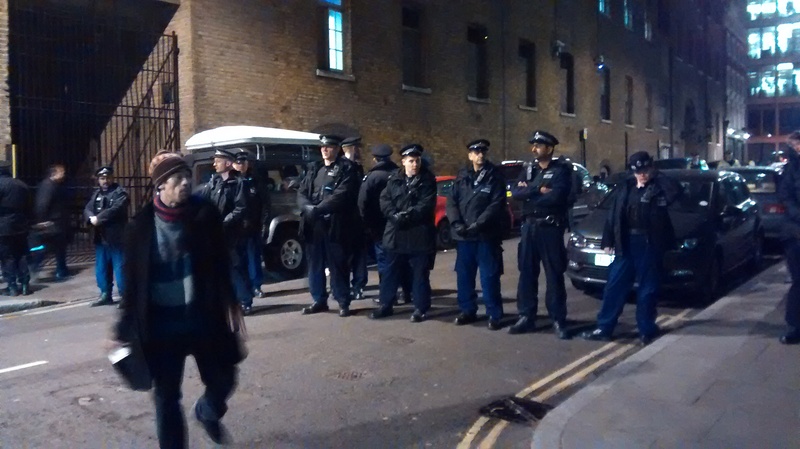 This entry was posted in Action and tagged action, bailiff ball, bailiffs, Focus E15 mums on February 13, 2015 by housingactionsl.